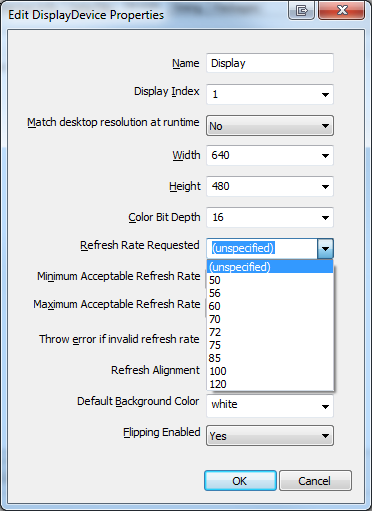 E-Prime 2.0 introduces the ability to specify a suggested Refresh Rate via the Display Device dialog. NOTE: The value is a suggested attempt. Use the min/max fields to throw an error if the actual refresh rate is not within a given range acceptable to the paradigm. Use the Display.RefreshRate column in the edat2 file or E-Basic Display.CalculatedRefreshRate property to obtain the actual value for the experiment session.